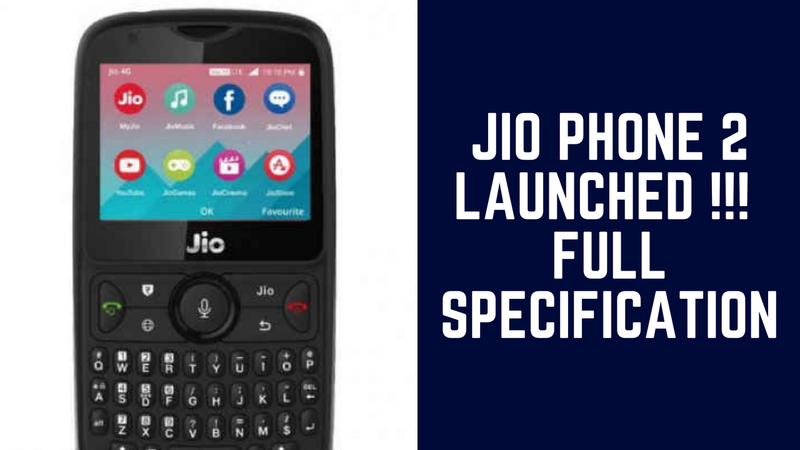 Reliance Jio Phone 2 has launched during the 41st Annual General Meeting of Reliance Industries. It has a 2.4 inch of screen with 2MP (Back) and 2MP VGA (Front) Camera. It consists the Qwerty keypad and 4 way Nav Key with LTE band and Dual SIM. It has a battery of 2000mAh and storage capacity is upto 128 GB (SD Card). It also contains a MicroUSB 2.0 port. The audio of this phone consists a Loud mono Speaker and the operating system provides by KAI OS. In the previous Jio Phone (jio phone-1) has also the KAI OS. So after better performance Jio continue this OS for its 2nd model. This Phone has also a 512 MB of RAM and the internal storage contains 4 GB of ROM. It comes with only Black Colour. It supports the VoLTE and VoWiFi. It also contains a FM, Bluetooth 4.2, Wi-Fi 802.11 b/g/n, GPS and NFC. The Pre Booking of Jio Phone 2 starts from 15th August 2018 with a price of Rs.2,999. 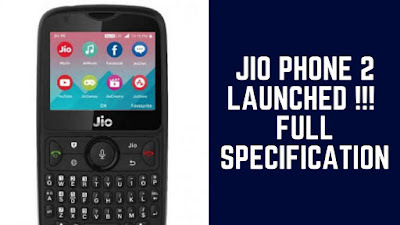 Jio also launched another offer called "Jio Monsoon Hungama Offer" through which you can exchange your old feature phone including Rs.501 with a new Jio phone.